The Nokia Lumia 920 is a bigger, faster, brighter Windows phone but can it take on the might of the iPhone 5? The Nokia Lumia 920 packs Windows 8 and a 4.5 inch IPS display over the Nokia Lumia 900. It's the flagship Windows Phone 8 handset for 2012 and introduces PureView camera technology in a bid to compete with the iPhone 5 and Samsung Galaxy S3. We like the slick unibody design which makes the Nokia Lumia 920 feel like a sturdy, luxurious slab of chocolate in the hand although the pure bulk of the Nokia Lumia 920 could disappoint. It's more of a family-sized treat for gadget fans, weighing in at a colossal 185g. The iPhone 5 weighs just 112g by comparison. The curved body allows ample space for speakers, looks stylish and if you (and your jean pocket) can cope with the weight and size (130.3mm x 70.8mm x 10.7mm) you'll enjoy the benefits it brings. There's good spacing of control buttons and a decent speaker at the bottom of the phone. Windows Phone 8 is an excellent OS and continues to make iOS 6 look like a boring alternative to the flashing tiles and infinitely customisable home screen options found on the Nokia Lumia 920. The bigger screen helps showcase the impressive 8 megapixel camera which is, like everything else, ultra fast thanks to a Snapdragon S4 processor making apps move with zero lag. The persistent lack of apps and major apps is still the biggest drawback despite Nokia going to great lengths to show Windows Phone 8 in the best way possible. 32GB of internal storage is big enough for us to forget our complaints about the lack of a MicroSD socket on previous models too. The IPS display and deep blacks work well - there's little glare or reflection from the 4.5 inch screen which, in pixel terms, clocks in at 1280 x 768 pixels per inch. For movies and photos it works brilliantly and though it doesn't have the best resolution on show, the menus and OS are super clear and bold, designed to match the screen. The end result is that it's an impressive display that can't match the best but offers great colour and depth for the screen size - it still manages a wow factor against 2011 smartphones. 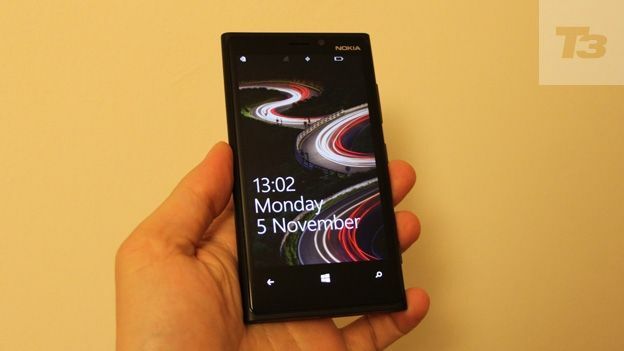 The Nokia Lumia 920 is the fastest Lumia yet, not that any Lumia could be accused of being slow. The screen itself is responsive and the easy start up menus and integration of contacts and old numbers is as simple as it gets. The exclusive apps like Nokia Drive and SkyDrive options are genuinely brilliant and, really, the on-board navigation and clever Local Scout services kick Apple maps into touch - the Nokia 920 makes the best of them. The battery life is disappointing and inconsistent. It's hard to see what actually uses power but we managed a day with moderate use. The fast wireless charging accessory (simply place your phone on the black plastic charge plate) works well but does get hot and it's not the slim bedside table companion we had hoped for. Chunky with good specs and a brilliant take on Windows Phone 8, there's lots to like about the Nokia Lumia 920. The battery life and chunky build may be enough to disappoint potential buyers but they would miss out on the advantages of a super-powered Windows phone.